Classic, contemporary, and chic, Promenaid handrails are a stylish addition to any home, place of business or institution. They handsomely balance smart sophistication with everyday functionality and add refinement that extends throughout the house. 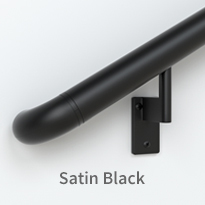 Promenaid satin-anodized aluminum handrails are available in Satin Black, Champagne Silver or Architectural Bronze to complement both modern and traditional décor. Promenaid TrueWood™ wrapped aluminum handrail, in Black Walnut, pre-finished Red Oak (or un-finished, which can be stained to the colour of your choice), is the world’s first and only fully functional handrail with the warmth and natural beauty of real wood. 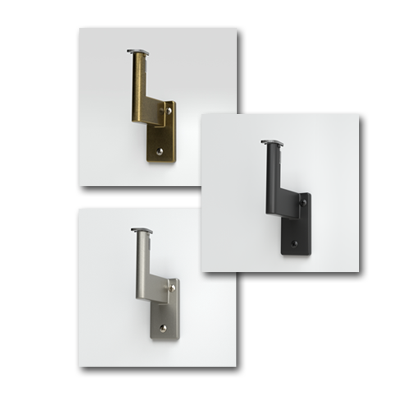 Combine any handrail with your choice of solid metal brackets and fittings in Satin Black, triple-plated in Matte Nickel or Antique Brass for enduring beauty. 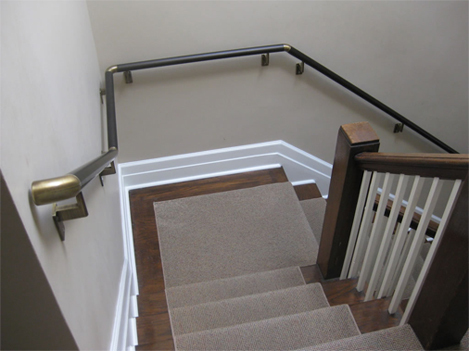 Learn more about our handrail kits, stair handrails and ada-compliant handrails. My decision to buy your beautifully made product was one of the best decisions I made on our remodel. My guests have, to a person, been in awe of how sturdy and gorgeous it is. I can’t thank you enough for your product. 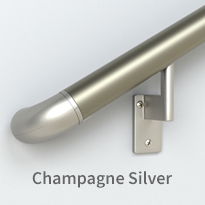 It is reasonably priced, well-designed, beautifully engineered, and downright glamorous. And thanks for the many work-hours which I’m sure went into your ability to achieve this result. I will tell everyone I know how much you deserve their business. Our innovative handrails and grab bars can be installed anywhere – walkways, stairways, baths, showers – and easily change direction to accommodate every slope or corner without a break. They can adapt to the geometries of any staircase or room, giving homeowners and business owners optimal versatility. Offering uninterrupted support, Promenaid easily changes direction to accommodate every slope or corner without a break. And, with a design theme that is consistent and elegant, the flow of your handrail will integrate seamlessly with your architectural creativity. Learn more about our handrail kits and handrail components. I bought your handrails for my front porch. Now I want them in the house for the stairs and bathroom. Inside or outside, Promenaid handrails deliver reliable performance. 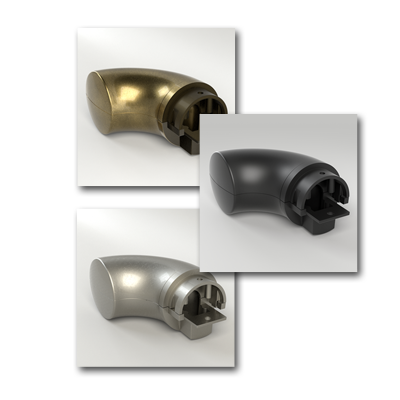 Adjustable elbows and ADA endcaps easily comply with the new Residential Code requiring continuous bends and wall returns. Promenaid handrails are designed to exceed commercial safety standards and bring peace of mind to every home. How strong and dependable are Promenaid handrails? Each bracket supports over 500 pounds. 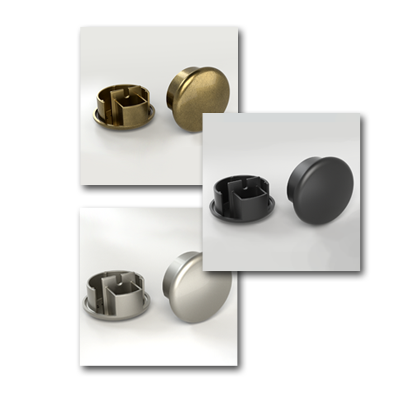 Promenaid® Endura™ Anodized Finish: For beauty that lasts, anodizing makes all the difference! Unlike painted finishes, Promenaid scratch and weather-resistant anodizing is an integral finish with a smooth metallic lustre that will never flake or chip. Promenaid TrueWood™: Promenaid TrueWood is a thin layer of genuine wood bonded to the patented Promenaid aluminum core. At 15 thousandths of an inch, the wood takes on the hardness of the aluminum, rendering it effectively dent and scratch resistant. Not only that, they’re immune to humidity, creating a wood handrail that never warps and is dead true regardless of length. 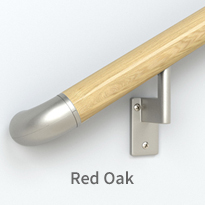 Hardware: All hardware is manufactured from die-cast zinc with additional protective layers to withstand the elements – indoors, outdoors, showers, walkways and marine/salty environments. 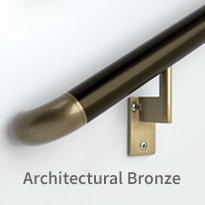 Our hardware is offered a variety of finishes, some of which are pictured below. 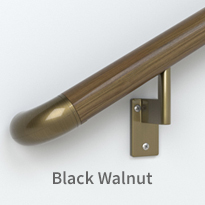 To view all our hardware options and components, click here. Our modular handrail components and simple mounting technology allow Promenaid to be installed quickly and easily — just like building blocks — so disruptions are minimized like never before. Promenaid handrails cut cleanly with a standard miter saw, or order them pre-cut from our factory. The patented brackets instantly align with wall studs, can be repositioned at any time, lock in place with a simple twist, and adjust to any slope. Then there are our amazing articulating elbows that magically adjust to make any corner or slope transition smooth, simple and precise. sanding required. Clip it together, screw it to the wall, and go! Whether you need a straight run or made-to measure handrail the waiting is over. While other handrails with equivalent performance require weeks or months just to manufacture, Promenaid handrails can be installed in one day. My contractor has installed hundreds of handrails on the staircases he creates. He was stunned by the ease and speed at which he was able to do the installation. Promenaid adjustable elbows and wall-return endcaps (also referred to as ADA Returns) easily comply with the new Residential Code requiring continuous bends and wall returns. They love them because Promenaid makes their decision easy. Whether you’re concerned about style, strength, building code, ease of installation or any combination of the above, Promenaid makes your choice – and your life easy. When you need a handrail the choice is simple. No comparable handrail comes close. 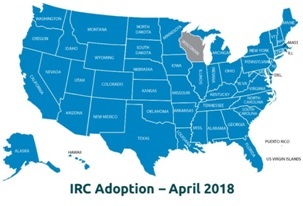 Visit our documentation and how-to videos pages to view or download the many resources that are available to make the installation process a breeze. Contact us to learn more about our handrails that are ADA compliant and a perfect solution for your next renovation or new construction project. If you are a designer and would to know how to include our handrails as part of your next design project, email us or call our team and we can begin that conversation. I appreciate the help and I’m sure I will find more applications for your product. I own several properties. The stellar engineering and simplicity that went into the design of your product is pure genius, and fun to work with. I love my handrails. I have 3 of them. 3ft, 4ft and 6ft. Because of the handrails, l feel a lot safer when I’m walking up and down my staircases and I’ve actually gotten compliments on them! My wife had knee surgery so I needed to install a handrail going down to the family room since we never had one. The handrail was easy to install and is very sturdy. The quality of the product is excellent and my wife is happy that I installed it so that she can get down the one step into the family room without the fear of falling. A great product!!!! Just what I was searching for to install horizontally on interior hallway to provide a bit of a safety rail for elderly person. Looks fantastic without that commercial appearance. Well designed and very easy to install. Because of Promenaid, we were able to finish the construction quickly, be ready for the building inspection and have our new restaurant ready for opening day.